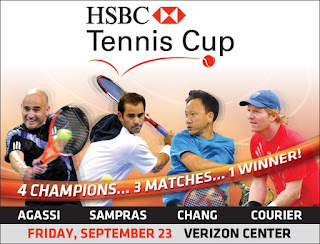 Agassi, Sampras, Chang and Courier - the US tennis stars of the 80's/90's reunite. To avoid the Ticketmaster fees, you may also want to consider simply purchasing your ticket at the venue. There are still a lot of tickets left for the DC event. Just as a note, each of these matches will each be 1-set long. There are two semi-finals and one final match. These are basically exhibition match quality, where the players will talk and interact with the fans (similar to the WTT atmosphere). There are also VIP pre-game events that include a 1-hour clinic and dinner with the stars.